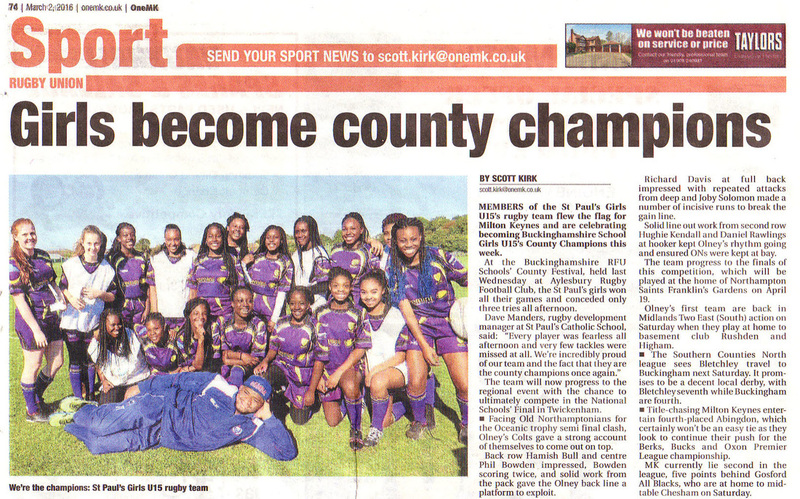 ​ St Paul’s Catholic School, Milton Keynes Girls’ U15’s Rugby Team became Buckinghamshire School Girls U15’s County Champions at the Buckinghamshire RFU Schools’ County Festival, held on Wednesday 24 February 2016 at Aylesbury Rugby Football Club. The St Paul’s girls won all of their games and conceded only three tries all afternoon. Members of the St Paul’s Girls’ U15’s Rugby Team flew the flag for Milton Keynes and are celebrating becoming Buckinghamshire School Girls U15’s County Champions this week. At the Buckinghamshire RFU Schools’ County Festival, held on Wednesday 24 February at Aylesbury Rugby Football Club, the St Paul’s girls won all of their games and conceded only three tries all afternoon. The team will now progress to the Regional event with the chance to ultimately compete in the National Schools’ Final in Twickenham. 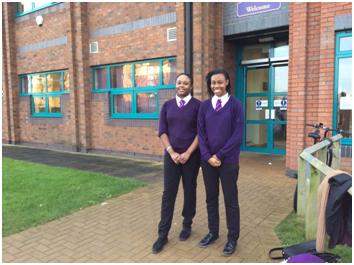 Nana Edjekoomhene, a Year 10 student, and Shaniah Herelle, who is in Year 9, are celebrating being selected for the Rugby Football Union’s Girls’ Under 15’s South West Academy Squad. Nana and Shaniah travelled down to Frome in Somerset to take part in the South West trails along with around 60 girls from the region. From these a squad of 28 was selected. Nana and Shaniah play in St Paul’s Under 15’s rugby squad and the team has already experienced success this season having won the Sibford School Girls U15’s 7’s Tournament for the second year running. In March they will be competing in the Buckinghamshire Schools U15’s Girls Festival with a chance to ultimately play in the National School Finals at Twickenham. Nana and Shaniah play in St Paul’s Under 15’s rugby squad and the team has already experienced success this season having won the Sibford School Girls U15’s 7’s Tournament for the second year running.